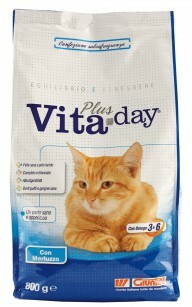 Vita Day Mix is a complete food made from high quality raw materials including certain minerals present in a “protected” form to stimulate the cat’s immune system. A constant use of Vita Day Mix will ensure that your cat is in perfect health with shiny fur and full of vitality, even in old age. The food may be served dry direct from the bag. Always leave a bowl of fresh clean water available for your cat. Composizione croccantini mix: Cereals, Meat and animal derivatives, Derivatives of vegetable origin, Vegetable protein extracts, Vegetables, Oils and fats, Fish and fish derivatives, Minerals. Composizione croccantini with beef: Cereals (min. 8%), Meat and animal derivatives (beef min. 6%), Derivatives of vegetable origin, Vegetable protein extracts, Vegetables, Oils and fats, Minerals. Composizione croccantini with chicken: Cereals (min. 8%), Meat and animal derivatives (chicken min. 6%), Derivatives of vegetable origin, Vegetable protein extracts, Vegetables, Oils and fats, Minerals. 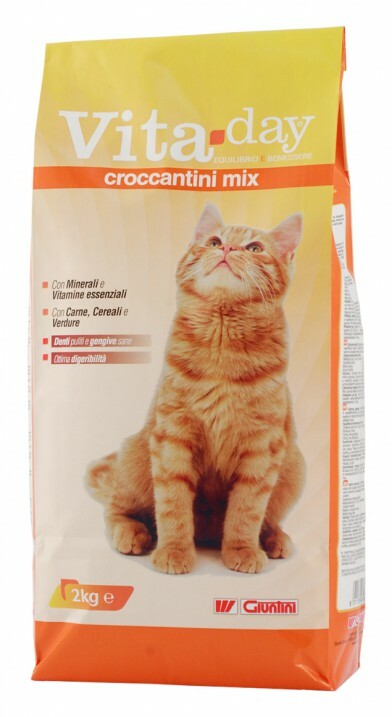 Composizione croccantini with fish: Cereals, Meat and animal derivatives, Derivatives of vegetable origin, Vegetable protein extracts, Fish and fish derivatives (min. 4%), Vegetables, Oils and fats, Minerals. Crude protein: 29,0%; Crude oils and fats: 9,0%; Crude fibres: 3,0%; Crude ash: 8,5%. Vitamin A: 25.000 I.U./kg; Vitamin D3: 1.000 I.U./kg; Vitamin E: 70 mg/kg; E1 Iron: 70 mg/kg; E2 Iodine: 1 mg/kg; E4 Copper: 10 mg/kg; E5 Manganese: 70 mg/kg; E6 Zinc: 75 mg/kg; E8 Selenio: 0,10 mg/kg.